Alicia's done it again. Felt ornaments so delightful it makes me want to cry. Look at that red coat. The red gingham... the tiny stitching. Could it be more darling? 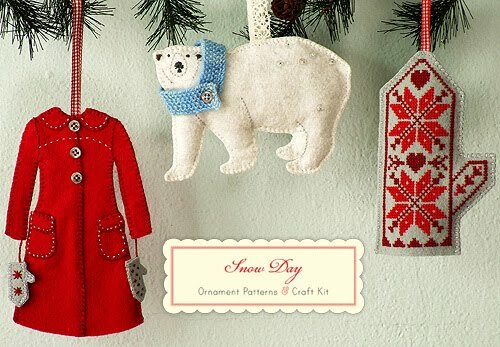 The last three years she's designed these felt ornament kits and each year I drool and then hem and haw over them until they are gone. I have no embroidery skills. Would I massacre their heirloom-worthy loveliness? Would this fear cause me to leave the kits in their bags indefinitely? How sad would that be? I was actually slightly relieved when I saw the new kit. I can't possibly buy it since I never actually bought the previous kits. Right? Can't not have a complete set. Then I scroll down. Oh... oh! It's the cottage with the sweet beaded lights from last year, the tree with the perfectly placed sequins, the charming pink cocoa cup and... *sigh* the beloved, much-remembered ice skate. She's re-released the last two year's sets. My heart beats faster. Now a new reason to hem and haw... should I spend $75. on ornament kits that may suffer the horrible fates listed above? Oh, but look at that ice skate. Can I resist? LOVE THEM! I'll happily make them with you! But, why not just buy the materials ourselves and steal her designs, Darlaina? (I am a total pirate.) Then we could make more of them and for less don't you think? I'd bet good money that, just by looking at the pictures, you and I could make patterns for most of those things (the ice skate could be tricky, maybe) The coat would be a cinch. very cute! but christmas ornaments! already!? anyway-you would never screw them up, you would prob. find a way to make them cuter. and like kellyj said-i bet you could make your own pattern. if you do though, i want a to make some too.